Original POLJOT STRAP AND BOX ! VERY GOOD CONDITION ! SEE PICTURES FOR CONDITION ! This is Classic Ussr Automatic Gold plated Watch POLJOT De luxe rare beautiful black brown Band the watch is good used condition small scratches see scan and judge. Quality Mark of the USSR Watch 23 Jewels Cal 2209 mid 60-70 years. 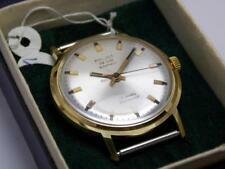 This is the legendary watch made in the USSR. from the USSR 100% working. This is a unique clock of the Soviet era. Slim, ergonomic watch case emphasizes lightness. Poljot de Luxe. Country of origin: USSR. Functions: Hours, minutes, seconds. Only original things ! not radioactive. Thickness: 8 mm. Dial :White. Glass: Plastic. Soviet era slim POLJOT DeLuxe watch. This watch is one the world thinnest watch. POLJOT De Luxe. Gold Plated / Gilded Case AU20. USSR Russian. The watch is in a good working condition, recently serviced, cleaned and oiled. All the details you can see on my photos. POLJOT PRESIDENT. 1MCHZ was a prolific watch industry - it was at this plant that the Sturmanskie, Signal, Rodina, Antarctica, 3133 Chronographs, and many other amazing watches were designed and manufactured. Photos are real, you will receive exactly what you see! The Item Location: The United States, Illinois. "POLJOT DE LUXE. WITH THE BEAUTIFUL RARE DIAL AND. AUTOMATIC GOLD PLATED WATCH. ON THE DIAL HAVE SMALL SPORTS AND VERY SMALL. THE WATCH IS IN A GOOD USED CONDITION BUT. THE WATCH WORKS VERY WELL AND SERVICED. A lot of scratches, nicks, dirt, wear & tear (see pictures). This beautiful caliber with blued screws and decoration ( Geneva stripes ) can be clearly watched through the screwed crystal back. Beautiful Luxury ultra slim vogue Russian USSR watch Luch 2209 SU 23 jewels AU. Men's mechanical watch Luch 2209 SU Chrome body. New. In operation were not. OK. Ideal condition. Options for the photo. Trending at $147.00eBay determines this price through a machine learned model of the product's sale prices within the last 90 days. The length of the strap with the watch is - 23 cm. The gold of the watch is very well preserved. Watch is serviced by a watchmaker. Watch works exactly. Everything original the watch. Thickness of the watch with a glass - 7 mm. Caliber: 2209;. 23 Jewels. Watch thickness - 10 mm. The watch was serviced by a professional watchmaker recently. The watch is used. Lug width - 18 mm. NEW OLD Watch POLJOT De LUXE Extra SLIM Men's Vintage USSR Stainless Steel. Quality Mark of the USSR! from the USSR 100% working. The slim, ergonomic watch case emphasizes lightness. This is a unique watch of the Soviet era. Model with 60-70 years. It will be very interesting to see my other sales! USSR MADE LUCH Poljot de luxe ultra slim watch. Band - 18 mm. Size of case - 36 mm. Soviet USSR watch. Case: gold plated. Minsk Watch Factory was founded 1953. The Minsk Watch Factory was built with an orientation on the issue of wide gamut of watch, and already with the issue of it`s first collection in 1956 watch of trade mark LUCH began to be in enhanceable demand. POLJOT DE LUXE. Soviet USSR watch. Case: gold plated. Caliber: 2209. 1 x Luxury Watch. Hi quality Leather Band & Gift Box. 1 x Watch Passport. Year of Manufacture(approx.). Length from lugs to lugs: 42mm. Band width: 18mm. Jewels: 23. Ultra Slim elegant. Very thin and elegant 0.8 mm! The power reserve of 24 hours. The watch case is gold plated and has AU20 plating. 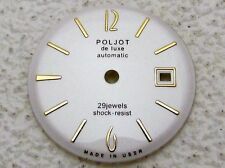 WATCH POLJOT DE LUXE AUTOMATIC. Case material: Brass is gilded. Country/Region of manufacture: USSR. On the watch case there may be minor scratches and scuffs from use. The case is very good to near perfect, 20 microns gold plated, as it can be clearly seen in the images showing only minor wear. The dial is very good, signed Seconda de luxe automatic, 29 jewels shockproof and Made in USSR. SEKONDA (POLJOT) DE LUXE. Soviet USSR watch. A good gift and souvenir for people who love technique. No cleaning. A condition on a REAL photo. Look at the original photos! You receive what you see. Condition: WORKING WATCH, WORK SLOW, MAY NEED CLEANING. WE’LL LEAVE THE GRADING TO YOU. POLJOT DE LUXE. Soviet USSR watch. Gold plated AU20, with new leather strap. Very good condition. Have few scratches (very little) on case and glass. Ready to wear or for a gift. Made in USSR. We'll try to do everything we can to resolve the issue. Vintage mechanical watch "Poljot de Luxe" Automatic, 29 jewels, USSR, 1960s. Watch is full serviced, glass and case in exellent condition. The watch is equipped with a new strap from genuine leather. You will receive the watch shown in the photo. This WATCH is made in USSR in 1960 years. This watch produced by FACTORY in 1MChZ (Moscow). Body:gold plated. Dial: 12 hours face. The case is in excellent condition. The dial in good condition.Glass is polish, free of scratches. Throughout all the more than a 70-year-old history it was and remains the leader in working out and manufacture of high-precision clockworks. They were applied in aircraft, on fleet, in the space-rocket technics – a word, there, where the highest accuracy and reliability is required. It was made in the middle of 195 0`s at the Moscow Watch Factory (1MChZ). The watch is in a used, but fully working condition, recently serviced, cleaned and oiled. With stainless steel back. The watch is working. Maybe needs a service. 1 MChZ KIROVA. Poljot De Luxe. Ivory band watches are traditional and tasteful accessories that will never go out of style. With tasteful elegance, they showcase sophistication and class. Multi-color band wristwatches are great for adding a pop of style to any outfit. They have a unique appearance, which is sure to attract attention at every occasion. Plastic band watches have a casual style, giving them a laid-back appearance that can be worn for any occasion. The plastic bands have enhanced flexibility for additional comfort. Stainless steel band wristwatches have a modern style for a contemporary appearance. Stainless steel bands are resistant to corrosion, making them extremely durable. Often associated with elegance and style, brown face wristwatches will add unmatched style to any ensemble. Impressive in their simplicity, they have a traditional appearance, which is ideal for a minimalist timepiece. Yellow face watches will add a pop of color to any look. With a unique face color, they are excellent for a signature accessory.